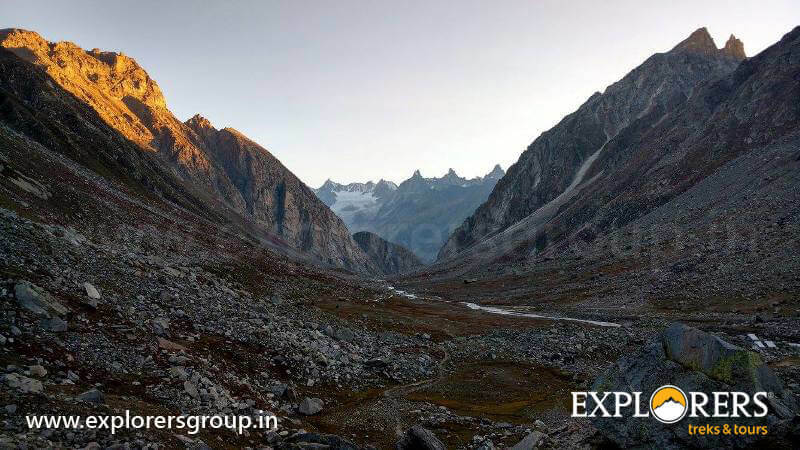 Want to enjoy the pristine Himalayan wilderness and have a memorable trekking experience, which takes you in a different tangent altogether, Welcome to HAMTA PASS TREK (A GROUP OF GIGANTIC FOLDED MOUNTAIN VALLEYS). 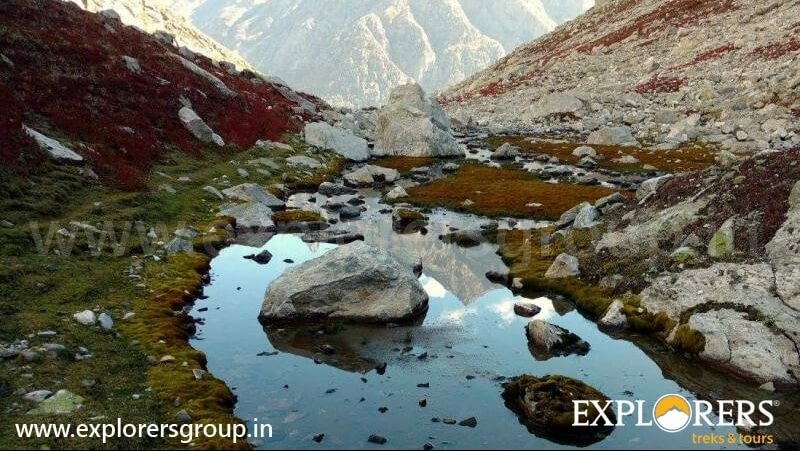 This exotic and immensely rewarding trek encompasses the mountainous vistas of the divinely beautiful Kullu & Manali valley and beyond Pirpanjal valleys and traverses the high altitude passes of ‘HAMTA PASS’ means at the top solid heap of rocks & Snow and passage goes through into Chhatru, Chandertal Lake (The Lake of Moon) and Spiti Valley. 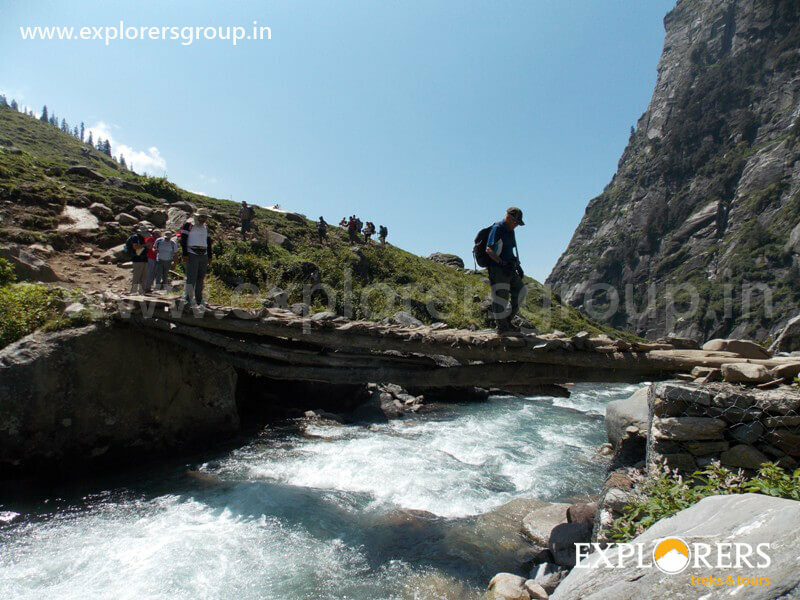 Hamta pass trek is well known among foreigner trekkers and also shortest route to go to Spiti and Kaza valley during ancient times. 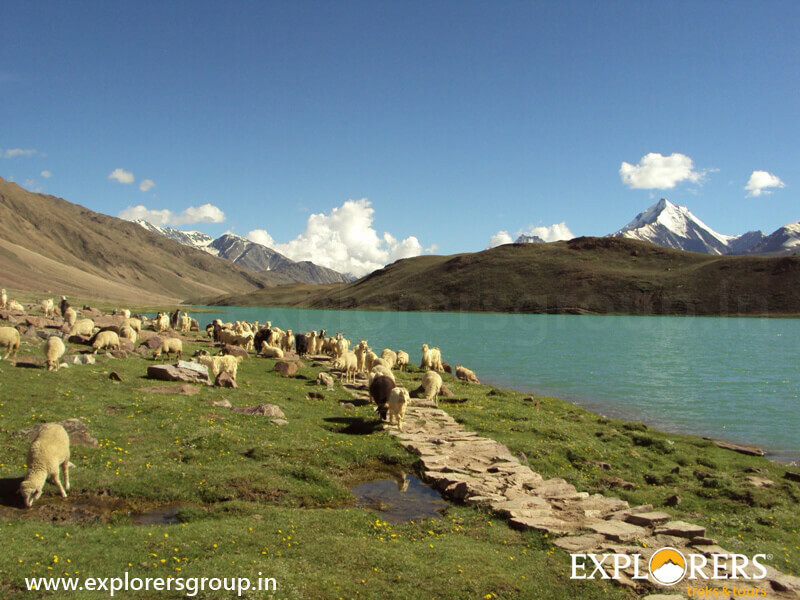 Chandra Tal (meaning the Lake of the Moon), or Chandra Tal, is situated at an altitude of about 4,300 meters (14,190 ft) in the Himalayas. 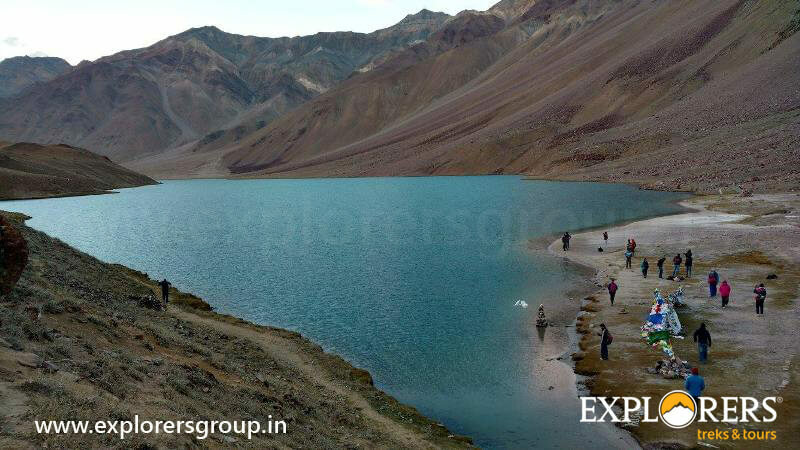 Chandra Taal is a popular destination for trekkers and campers. 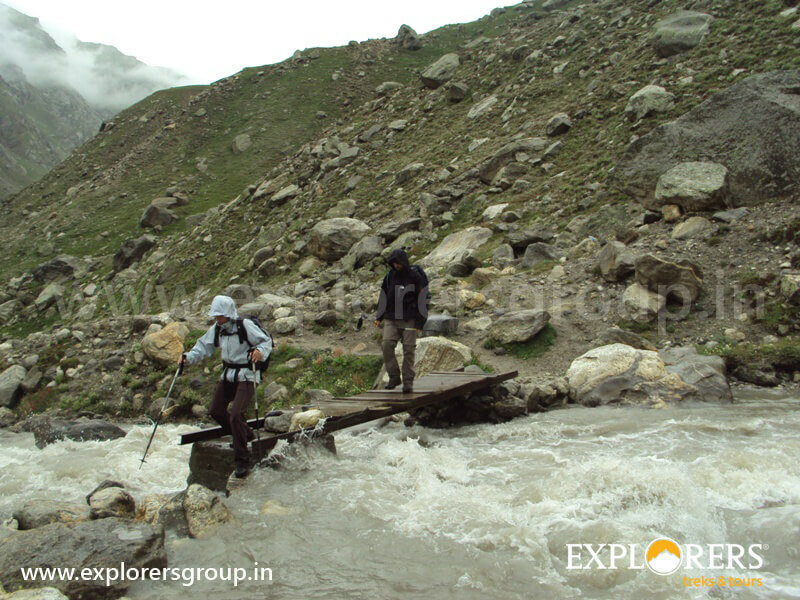 Explorers promise you the best of experience…the likes of which you will never have encountered before. 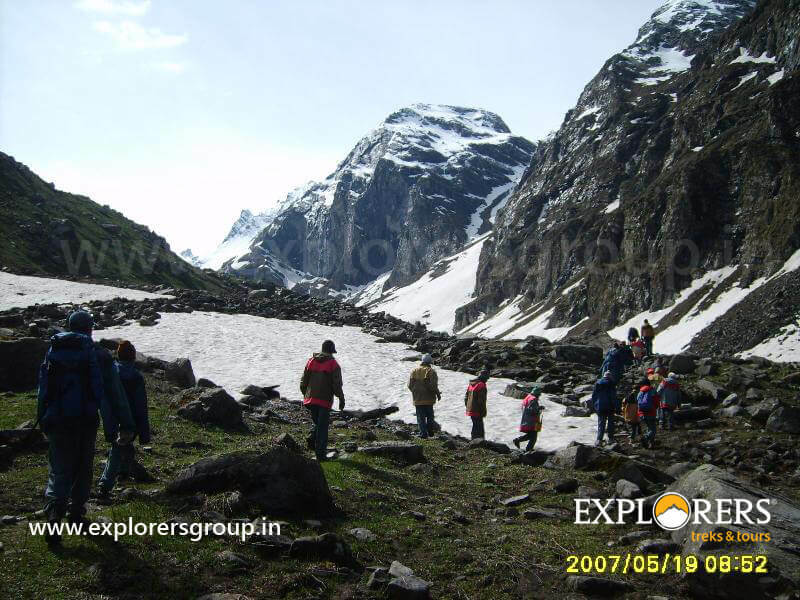 Please Call for Availability before you book Hampta Pass Trek, to avoid 5% Transaction Charges. 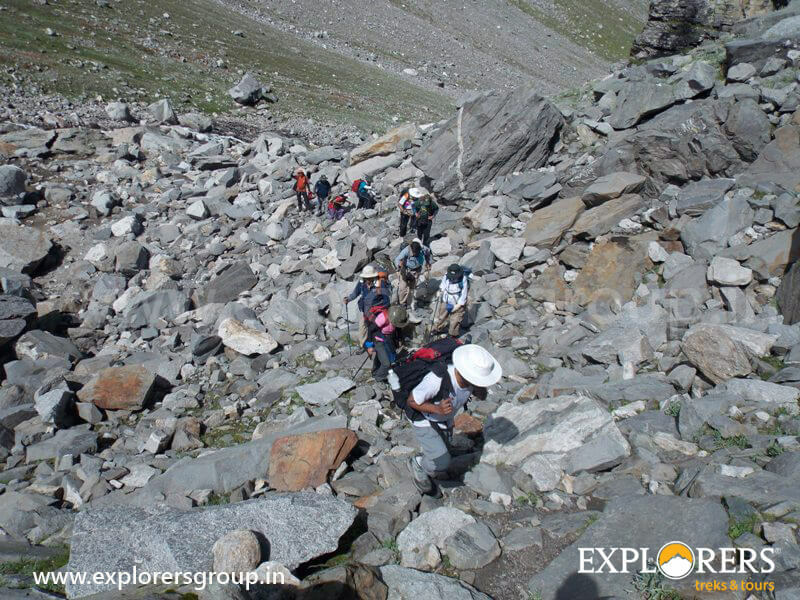 Last date of Enrollment for Hampta Pass Trek: Limited Seats… Book your Seat in Advance i.e. before 122 days to avail Early Bird Discount. 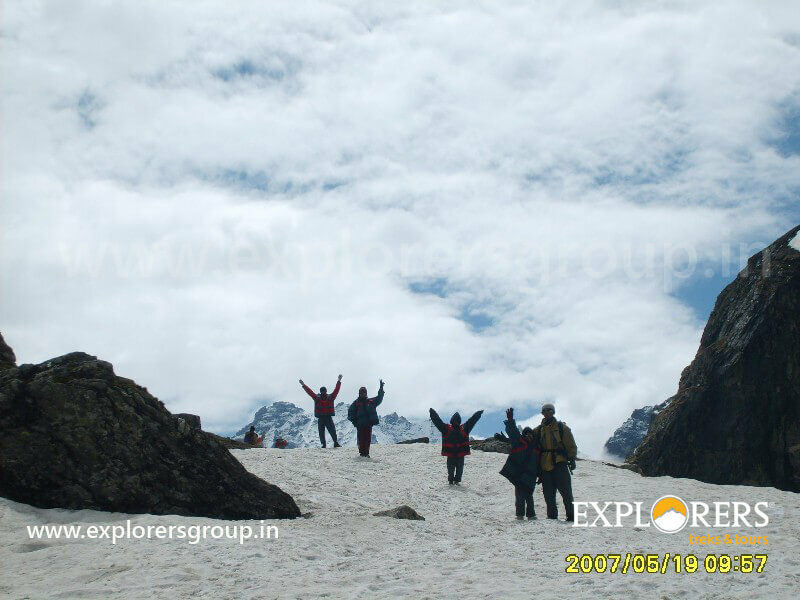 Departure Date & Time for Hampta Pass Trek:Day 1 by 05.00 pm from New Delhi Volvo Point. 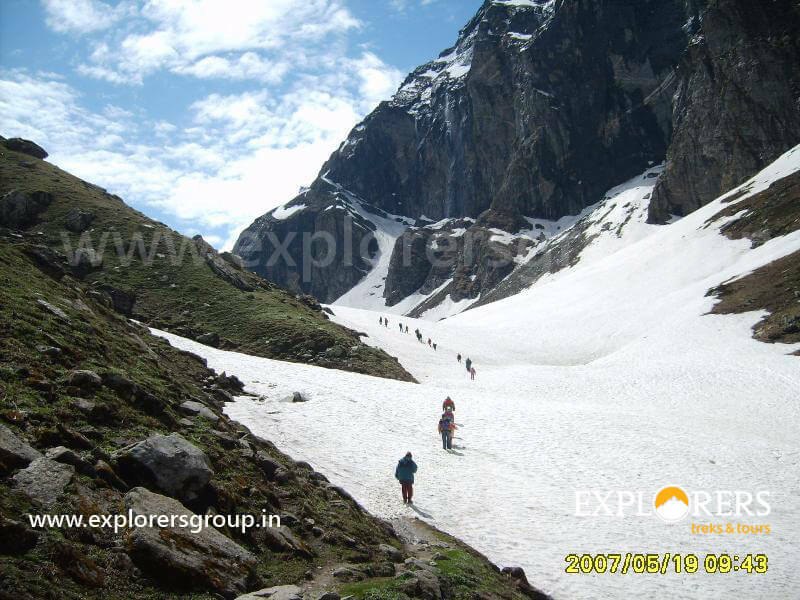 Arrival Date & Time for Hampta Pass Trek: Day 10 around 08.00 am at New Delhi Volvo Point. 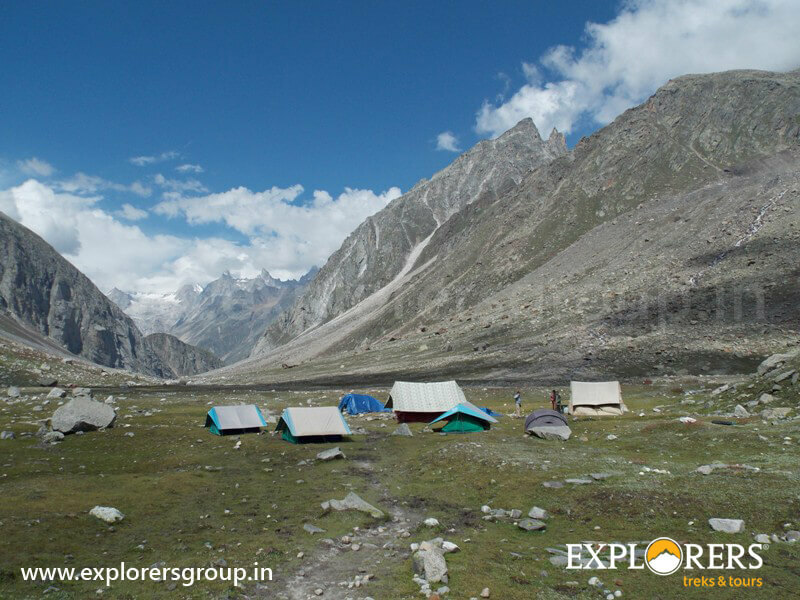 Type of Accommodation in Hampta Pass Trek: Accommodation in tents at Manali (Prini) & at higher campsite on multiple sharing basis. Route: New Delhi – Manali – New Delhi by Semi Sleeper Volvo. Arrive at Manali Bus Stand around 9 am. Onward Journey for just 3 kms by Local Sumo. 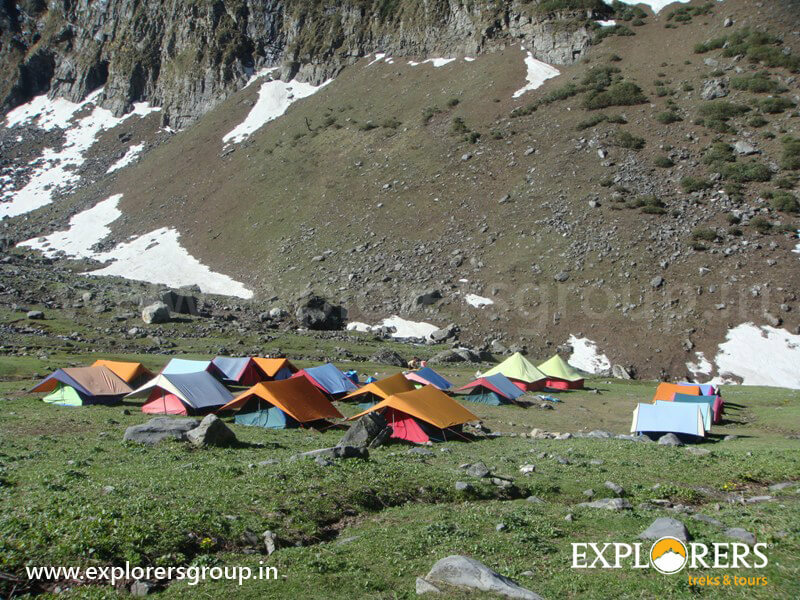 On arrival at Manali base camp tents will be allotted. After Refreshment Introduction, Group Games. Evening Briefing about Trek. Prini to Setan Village (2790 m) – 4 hours. 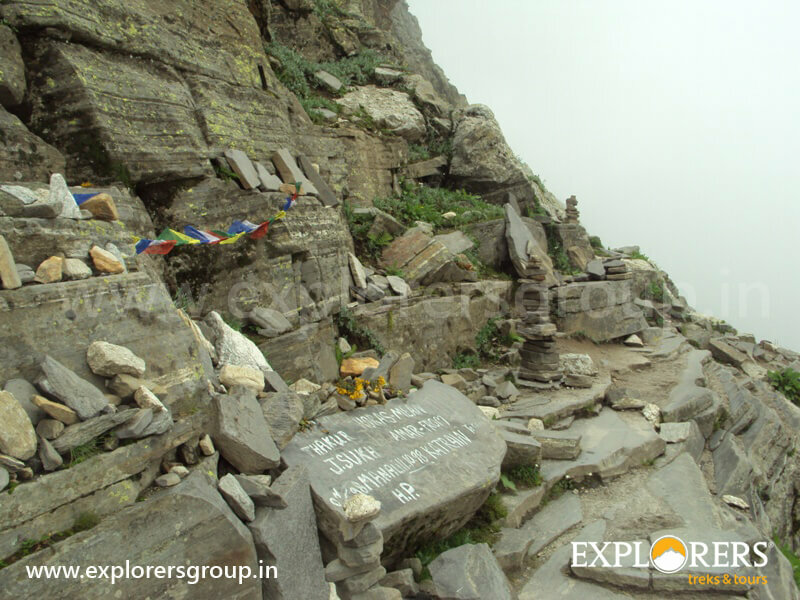 The first day’s walk is an acclimatization trek to camp via Jamdagini Rishi Temple with 3 hrs. On the way to Panduropa before Setan is followed by a potato farm, which is one of the largest farms in Himachal. 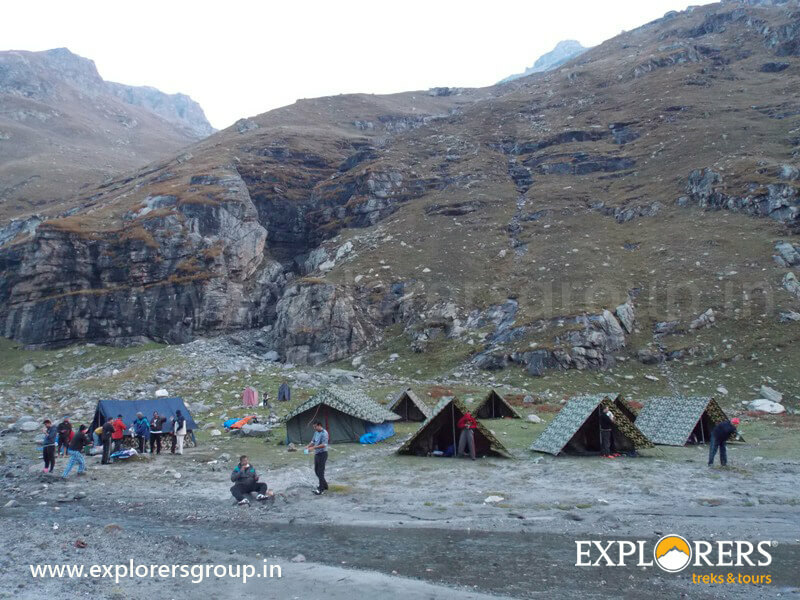 In the evening explore camp and move to evening activities. Setan to Chikka (3150M) 4hrs. 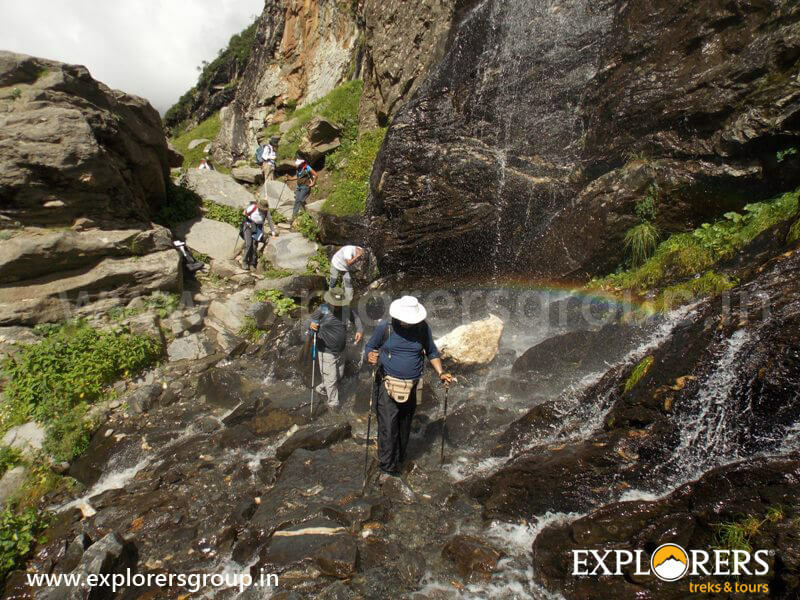 Trek starts at tea point Jhobri Nullah. 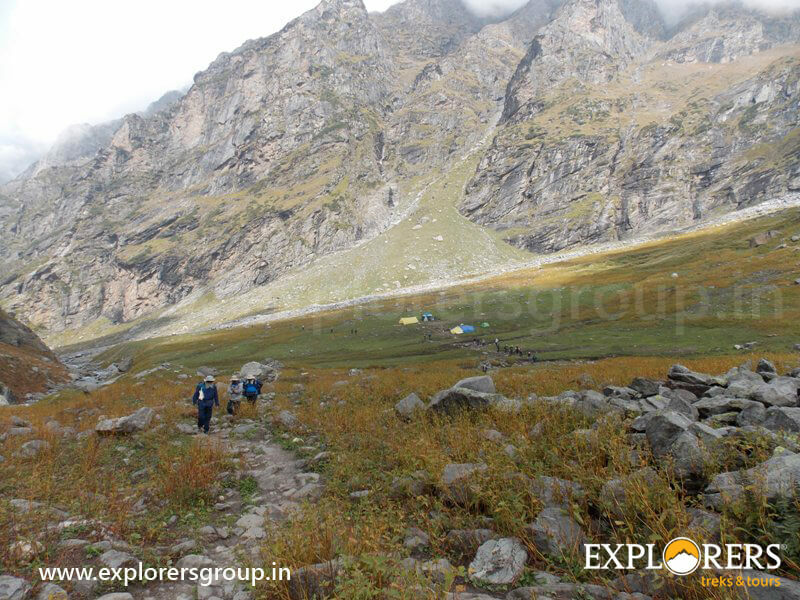 Today’s trek from Jobri Nullah to Chhika is very amazing on a grassy slope till Chhika campsite. 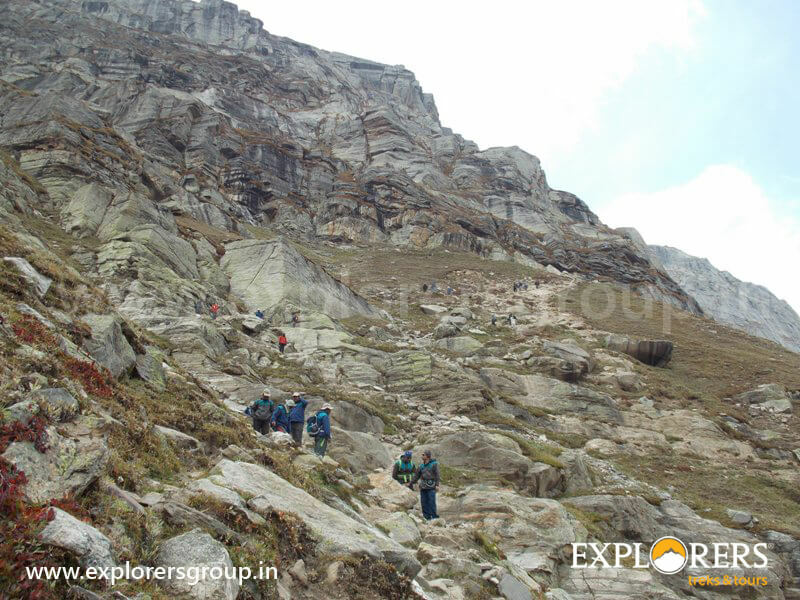 This trek is completely being occupied at special points by tea stall near before at Chhika. 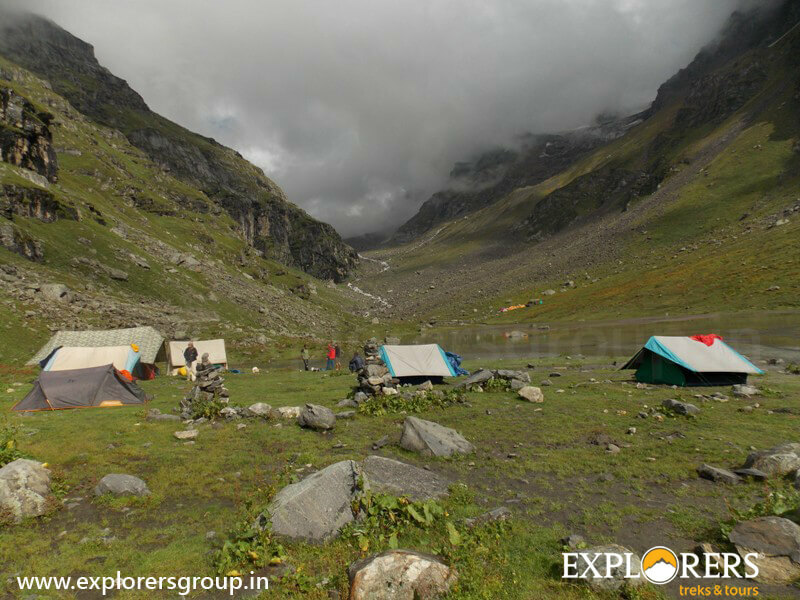 you could refreshes by having tea and other soft drinks and have rest & puff and a full stretch view of Chhika route and campsite. 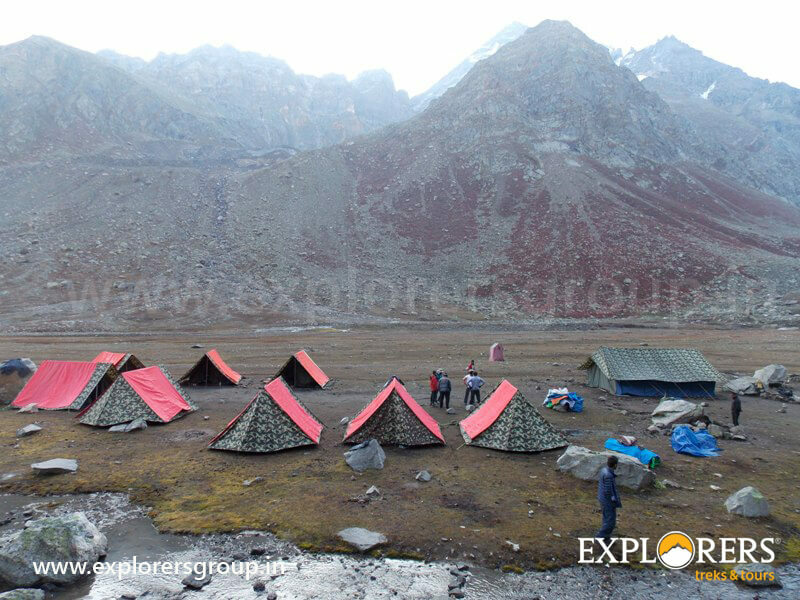 Chikka – Bhallu Ka Dhera (Base of Hamta Pass) (3750M) – 4 hours trek. Today’s trek starts in the beginning through bouldering on the mountainside of the slanted trail. Trail is a bit tricky to negotiate due to bouldering on its path and tiresome walk till cascading of waterfalls at rocky Cliffside. Mount Inder Killa keep walking and watching and follows all the way through tackling of small rocks and boulder makes you feel tiring and hungry by its long stretch of gradually grassy mixed slopes. Ballu- Ka- Dhera means a place for the Black and Brown Bears. The day’s trek encompasses Seven hours. You can split the journey in two halves, a steady ascent on moderate steep slope to Hamta Pass, thence a sharp descent to Shea Ghoru. The highest altitude will be achieved on this day at Hamta Pass (4300M). The climb to Hamta Pass is a vertical one and is a hard mount. 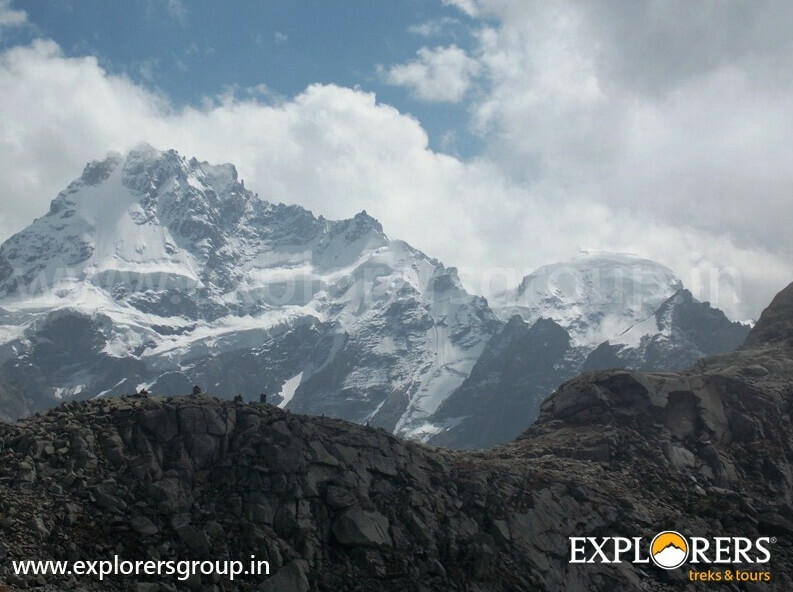 Enjoy for sometime in the pass, relish the beauty around and have close views of Deo Tibba (6100M) and fabled Indrasan (6221M) peaks and then get ready for the next descent to Shea Ghoru. After that it is all the way descend down in a zigzag right to the campsite Shea Ghoru. 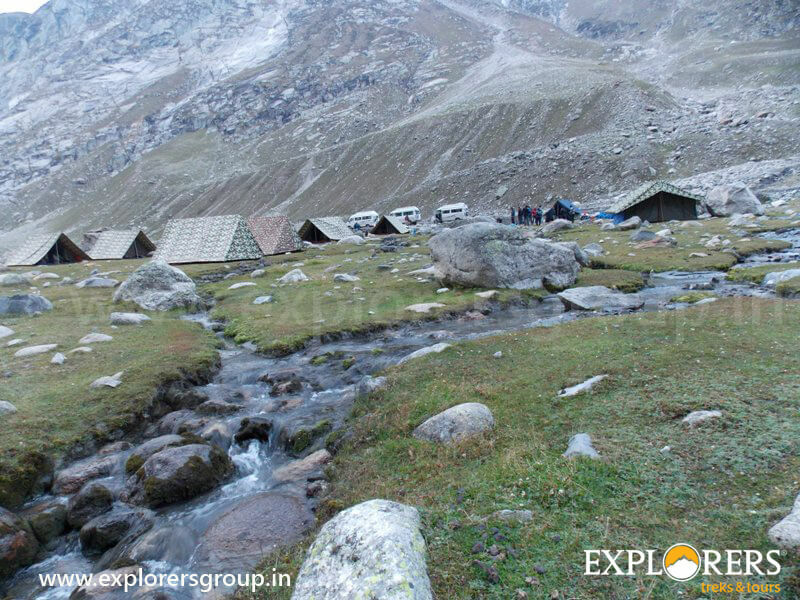 Shea Ghoru means a very cold place because it is very adjacent to the river and glacier snout. Overnight on the ground of river side at Shea Ghoru. Shea Ghoru – Chhatru (3330m.) 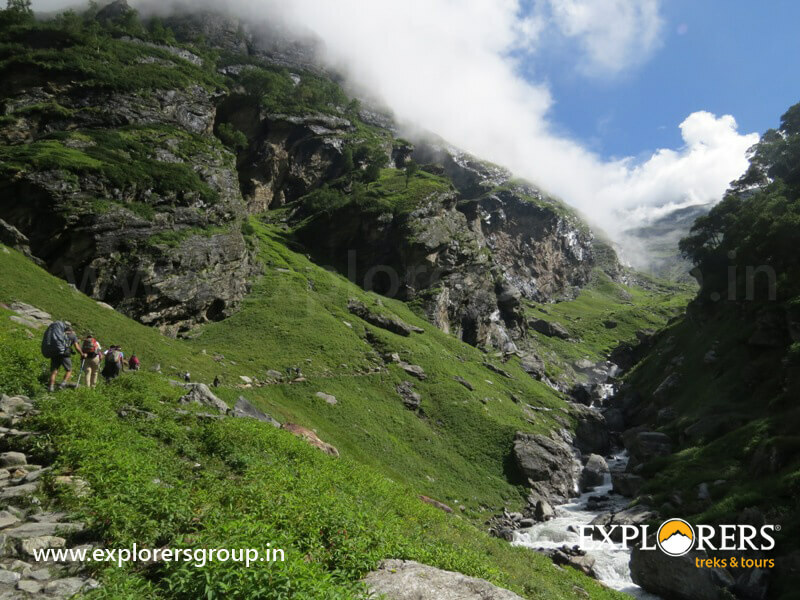 4 hours trek – Chander Tal Lake and back Chhatru 6 hours drive. Today’s walk is quite easy along the river upto the rock point, which is hard to cross in the rainy season. It is a gentle trek downhill from Shea Ghoru. The trail here again is by the side of the river valley between mountain ranges. 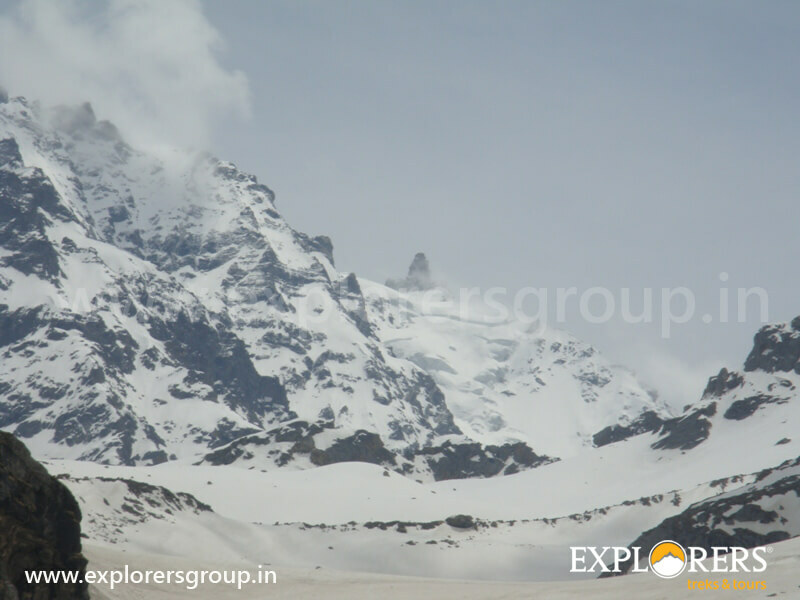 Chhatru is a confluence point via Rohtang Pass, Hamta Pass and Kaza & Spiti. 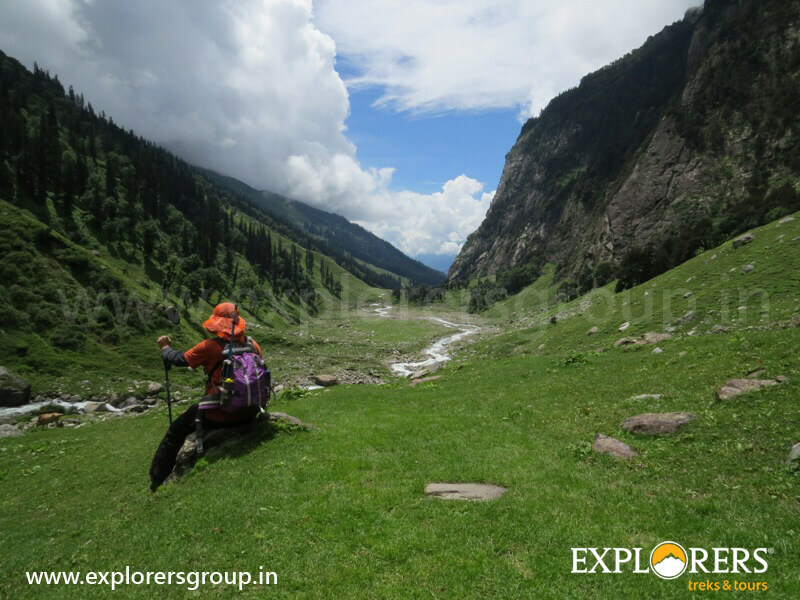 After reaching at Chhatru have packed lunch and after that it starts the real safari up to Chander Tal Lake through the rugged and Chandra river valley. 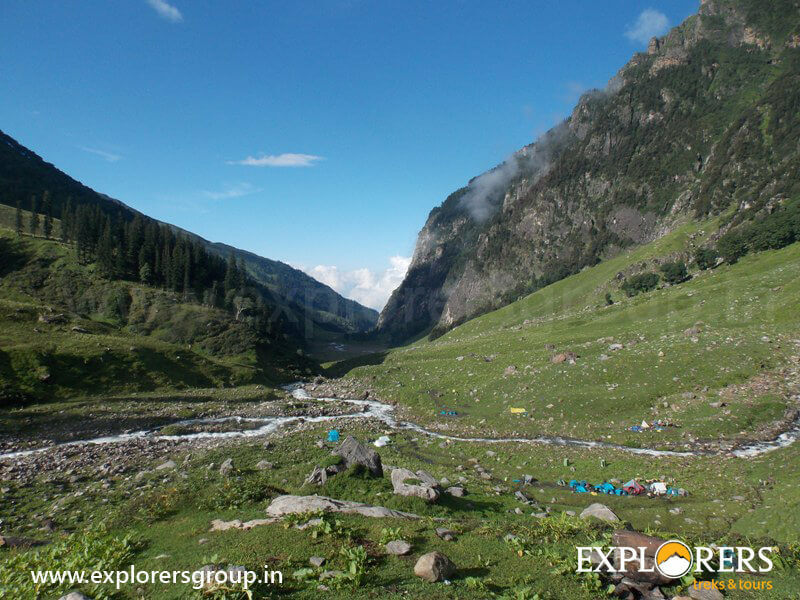 Chhatru – Manali 6 hours drive. Road from Chhatru to Grampoo is rugged one and it has an abundant nature beauties enrooted. Drive from Chhatru to Grampoo is one of worse at three points during rainy season and mountain waterfalls hits road badly. 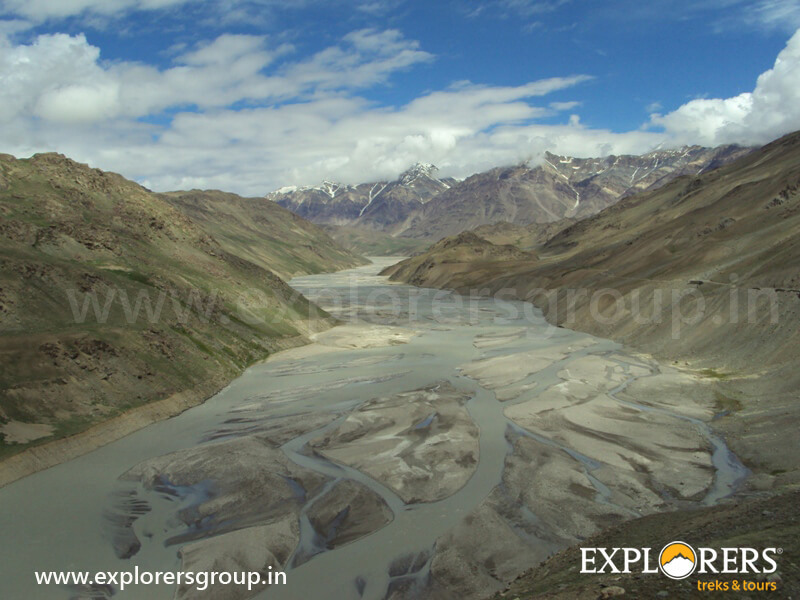 Grampoo divides the valley into Lahaul & Spiti. And turns right hand side at Grampoo towards Lahaul & Leh and left hand side turn to the Rohtang/Manali. 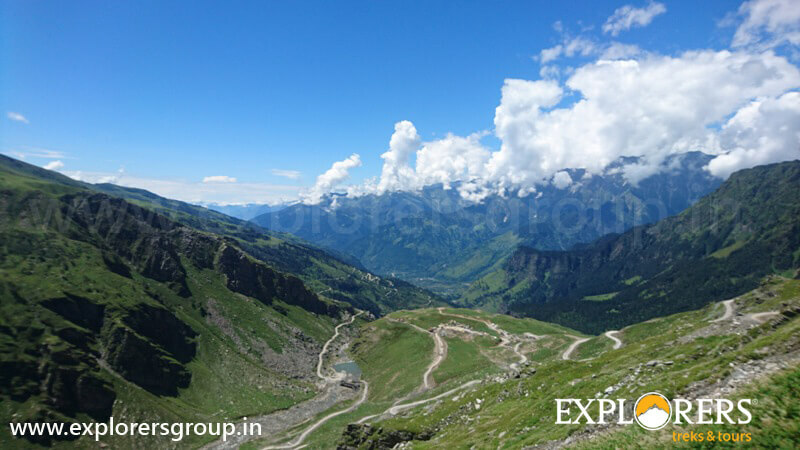 At Grampoo the real climb to Rohtang Pass, here one sees the majesty of the mountains at its height and splendid snow clad mountains & slowly descend down to over Rohtang Pass to Manali. After Breakfast participants are free to visit Manali Bazar with their own choice Lunch or report back to campsite for Lunch. In the evening, departure by Volvo to Delhi by 4 pm. Arrival at Delhi around 7.30 am. from Volvo point onward journey as per your reservations with ererlasting Memories. We will provide the following items to the Participants (For CAMP Period only on returnable basis. ).